Franciszka Themerson, daughter of the painter Jakub Weinles, was born in Warsaw, 1907, and graduated from the Warsaw Academy in 1931. The same year, she married the writer and experimental photographer, Stefan Themerson, and during the 1930s they became kingpins in a small but vital Polish film-making avant-garde. Their films were financed in part by a series of inventive books for children (his words, her drawings). Moving to Paris in 1938, they were overtaken by the outbreak of war, separated, and finally reunited in 1942 in London, where in 1948 they founded their highly original Gaberbocchus Press. She designed most of the 70 books they published and illustrated many, most memorably Jarry’s Ubu Roi (1951). She also designed marionette productions of UBU in Stockholm and Copenhagen (1960s/70s). 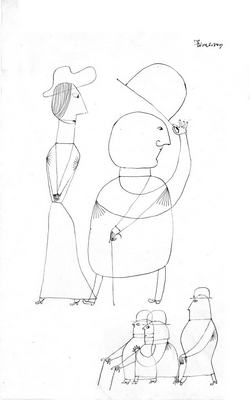 Alongside this busy world, Franciszka’s independent career as an artist was forged. A natural draughtsman, she steadily accumulated ways of painting that enabled her to draw with and into the paint, using knives, sticks, fingers, anything but the right end of a brush, and always with an easy dexterity. 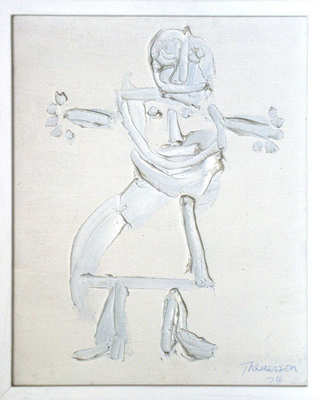 Line is at a higher premium than colour generally, and towards the end she even abandoned the light glazes of her mature art to work in luminous whites and off-whites. Her subject from the outset was the human condition, and the mood of her imagery ranged from the comic (but never caricatural) to the tragic (but never expressionistic) with techniques in which the subject and its medium walked hand-in-hand, embedded in each other. In a typical painting or drawing, faces and figures grow out of and dissolve into each other in what seems an endlessly fertile natural cycle. The wit and range of her titles exemplifies the breadth of her cultural reference. She died in London in 1988.